Anyone who has spent even a single winter here is probably aware of the importance of Fowlerville snow plowing. It can be hard to go about your regular daily routine when winter weather gets in the way. It is always a good idea to let the pros step in and take care of this service for you. Each year the amount of injuries and even deaths related to just snow shoveling increases. If you are not accustomed to this type of physical activity and then try to push your body to do so, the consequences could be dire. So instead of taking the risk it is a good idea to simply let someone else take care of the job for you. Avoid the use of harsh chemicals. While it may help with the snow it can be detrimental to nearby plant life. This is another reason it is a good idea to let pros take care of this job for you. Keep up with the driveway. Instead of trying to take care of a lot of snow once the storm subsides keep making passes to clear it as the snow falls. This will take less effort and energy and could help save you from throwing out your back. Make sure you use the right equipment. You have to make sure the machinery you use will be appropriate for the type of surface you are going over. Otherwise it will do more harm than good. Don’t rest your snow piles against structures like walls. This can add too much pressure or stress and could cause damage. Instead, make piles in open spaces. And when you finally realize it is all too much for you then you can brush the snow off your boots and return to your nice warm home where you can call in the pros. Of course when it comes to taking care of your winter services not just any team will do. You need the best crew and that’s Rainmaker Irrigation. Just like we can take the best care of your yard when the weather is nice we can help as well when the weather turns nasty. 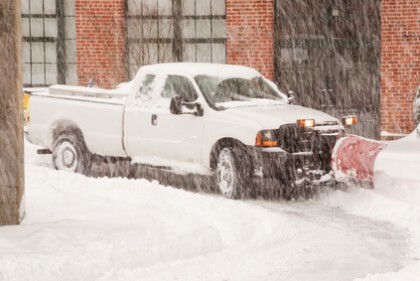 We offer a variety of services including Fowlerville snow plowing, salting and even tasks like seasonal cleanup. So contact us to find out more about what we can do for you. If you are looking for irrigation experts in the Howell area please give us a call at 734-564-1373 or complete our online form.